The Eldorado is the latest spa design and has been crafted from the Monarch Spa. It has the same deep, comfortable Captain’s Chair, but the other main seat is the “No-float” Lounger. Not only does it allow you to put your feet up, there are jets for the entire body, neck, back, hamstrings, calves, and the feet… truly all-inclusive. Unique styling and seat positioning actually allows room for 5 adults. Our top-of-the-line hot tub offering the total-therapy package and amenity options. A great therapeutic hot tub featuring comforting touches of luxury. 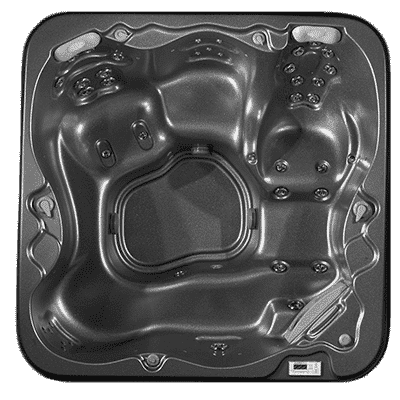 With different seats, seat heights, jet patterns and jet sizes, your Aspen Spa is crafted to meet your personal needs for relaxation and comfort. Mouse over the blue arrows to learn more. Customize Your Spa: enhance your experience. Your Aspen Spa reaches its full potential when you select the amenities that take your hot tub from relaxing… to luxurious. Not only do you get to choose your spa shell color, cabinet color, and cover color, you also get to select from options that excite the senses and enhance your spa experience. From waterfalls and built-in stereos to custom lighting systems, your spa becomes the ultimate escape and offers a one-of-a-kind experience that takes relaxation to a place that only Aspen Spas can create. Reaction to colors has an instant and incredible influence on our body and mind. Aspen Chromatherapy makes a positive impression on your mood, completing the therapy experience. Complete your spa experience with relaxing waterfalls and massaging jets. Aspen goes beyond the expected to create a complete sensory experience. Set the mood with your favorite music as you soak and unwind in perfect harmony. Aspen’s stereo system and pop-up speakers are water-resistant and built for years of enjoyment. Relaxing sounds of tranquil streams and soothing aromas help you escape to a place of wellbeing, comfort and happiness. Nothing soothes quite like auditory and aromatherapy. Aspen Spas allows you to personalize your spa with nine luxurious acrylic color options. Our spas are crafted using only genuine Lucite Acrylic featuring Microban Protection, which inhibits the growth of bacteria that causes stains and odors. With proper care, your spa will be as rich and lustrous years from now as they day it was delivered. Aspen Spas are built to last with maintenance-free Durawood spa cabinets. Made from recycled materials, these cabinets are resistant to moisture, corrosive substances and other environmental stresses. Aspen Spas high-density foam spa covers ensure maximum heat retention, even in extreme climates. Marine-grade vinyl covers are available in two colors and are equipped with safety locks.